Package Control: Attempting to use Urllib downloader due to WinINet error: Error downloading channel. (errno 12045) during HTTP write phase of downloading https://packagecontrol.io/channel_v3.json. Package Control: Error downloading channel. HTTP exception InvalidCertificateException (Host packagecontrol.io returned an invalid certificate ([SSL: CERTIFICATE_VERIFY_FAILED] certificate verify failed (_ssl.c:550))) downloading https://packagecontrol.io/channel_v3.json. 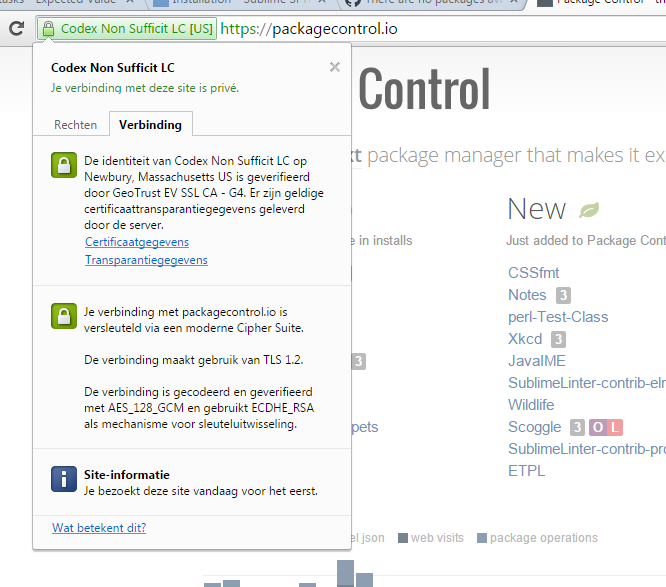 I also have added "debug" : true to the package setting-user of package control. Are there any solution for that ? I have been stucked. I want to code using Pyhton + Django. If there are any alternative, just mention it. The important thing is I am able to code with Python Django. 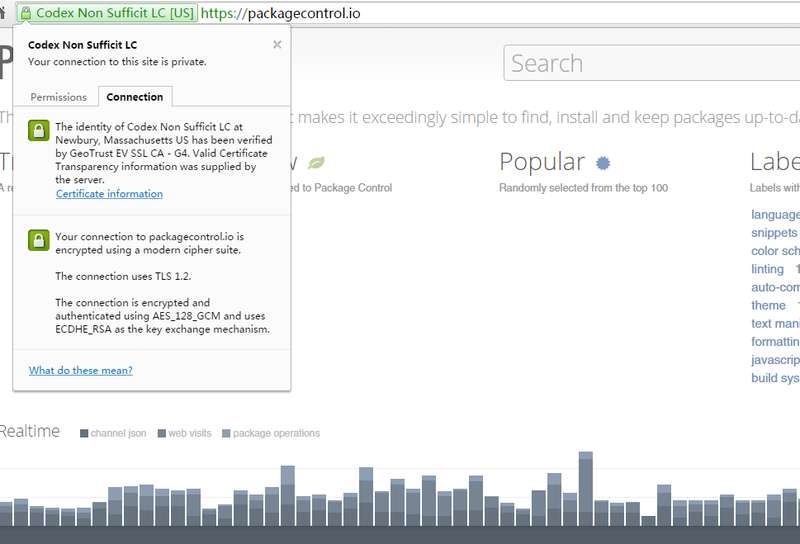 Can you visit https://packagecontrol.io in your browser and post a screenshot of the secure certificate information? Hmm, something seems weird about your connection to the site. The URL bar should have the padlock in green and say "Codex Non Sufficit LC". 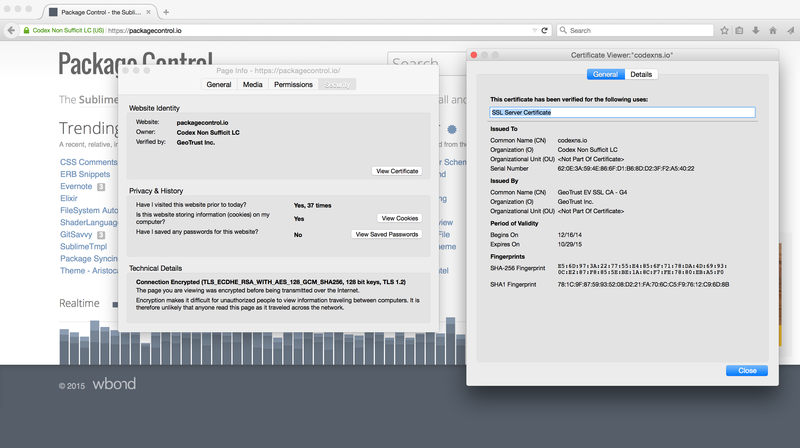 The cert fingerprint and serial number look correct, but something else is weird. What version of Windows XP are you using? Do you have a newer version of Windows on a different machine that you can test? Or possibly an OS X or Linux machine? I have the same problem using ST Version 3083 (Stable) on OS X Yosemite (Version 10.10.3). Package Control: Error downloading channel. URL error unknown error (_ssl.c:2228) downloading https://packagecontrol.io/channel_v3.json. When I visit the website the URL bar looks correct. @wbond Hello, I am using my old computer, with Windows XP SP3 32-bit operating system. Even I have tried to use manual installation, the result never come up. @billyhalim Can you post a screenshot with the "Page Info" window visible from Firefox? Also, what version of Firefox are you using? @billyhalim How about the security tab in that Page Info dialog? I am trying to figure out why you are getting a grey padlock instead of a green one. 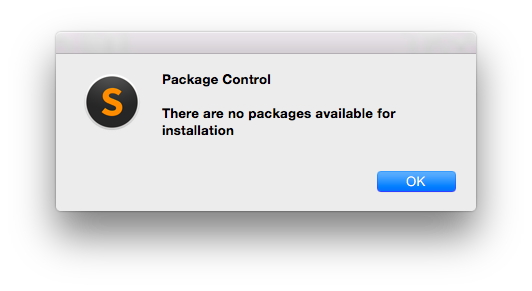 It may be related to the error you are seeing in Package Control. On the security tab the line that says Owner, it should say "Codex Non Sufficit LC". @billyhalim Are sites blocked on your connection to the internet? No, because the root cause was never found. My hunch is that it is somehow related to Windows XP. I'm using Windows 7 and i got the same problem. Any ideas? Hi, it happened to me the same in Windows. What I did was lower the level of UAC (User Account Control) and run the program in administrator mode No. I hope you serve. yesterday i also got the problem "package control There are no packages available for installation",then i found i opened the agent of visiting abroad website,when i closed it ,the problem was solved. mklink /D "Installed Packages" "C:\path\to\Dropbox\settings\sublime\Installed Packages"
to save the settings to dropbox BTW in case this is relevant. I did try deleting the ca file, and it got regenerated (or re-appeared somehow :)) but that didnt change anything ... still getting: "there are no packages available for installation"
So the thing is "no packages available for installation" just means something went wrong. In most situations, it is different things going wrong. This is why posting a debug log is important. It shows what is going on behind the scenes. 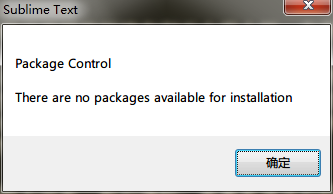 Package Control: Found git at "/usr/bin/git"
@nilsborchers You are running a really old version of Package Control which is no longer supported, hence there are no packages that can be installed. Follow the directions at https://packagecontrol.io/docs/troubleshooting#Purging_and_Reinstalling to upgrade. Also having problems. Archive link @weisk posted doesn't work here. Copying the following lines to Preferences > Package Settings > Package Control > Settings - User will allow you to install packages again. Following suggestion by Trippnology worked. Thanks! @Trippnology are there any security implications of getting directed to packages this way? @Trippnology worked - thank you. i take it we're just waiting until the proper channel is populated again. Glad this is working for you guys. It's very much just a workaround until the current feed comes back. Shoutout to @weisk for the archive link. @jelpern It's simply an old copy of the real feed. It is served over https, but there may be other concerns. work for me too, thanksTrippnology! Same here. JSON received from the site is empty for both v2 and v3 channels. Package Control: Attempting to use Urllib downloader due to WinINet error: Error downloading channel. Secure channel error, server not providing SSL (errno 12157) during HTTP write phase of downloading https://web.archive.org/web/20150905194312/https://packagecontrol.io/channel_v3.json. Package Control: Error downloading channel. HTTP exception InvalidCertificateException (Host web.archive.org returned an invalid certificate ([SSL: WRONG_VERSION_NUMBER] wrong version number (_ssl.c:550))) downloading https://web.archive.org/web/20150905194312/https://packagecontrol.io/channel_v3.json. same issue here, please advise. I have the same issue here. I've deleted and reinstalled manually the package manager and still not working. Is the repository working? Looks like package control repository server is down for now. Seemingly server is hosted by linode in atlanta, and the servers are experiencing DDoS attack. Check the status of the server. Guys, anyone having problems because of the DDoS attack should look at the workaround posted by @Trippnology above, #959 (comment) , works fine for me. That workaround will only list and install older versions of the packages from September 2015 or earlier (when the archive.org copy of the JSON file was made, I presume). Even if you try to upgrade a package you will not get a newer one unless you bypass Package Control and install the package manually. @Trippnology it does work, thanks. Any drawbacks when hardcoding the path in a config file? @heihachi88 Yes, you will have to remember to remove it again, once the official channel comes back online.